My name is Blossom and I am a LUCKY dog. 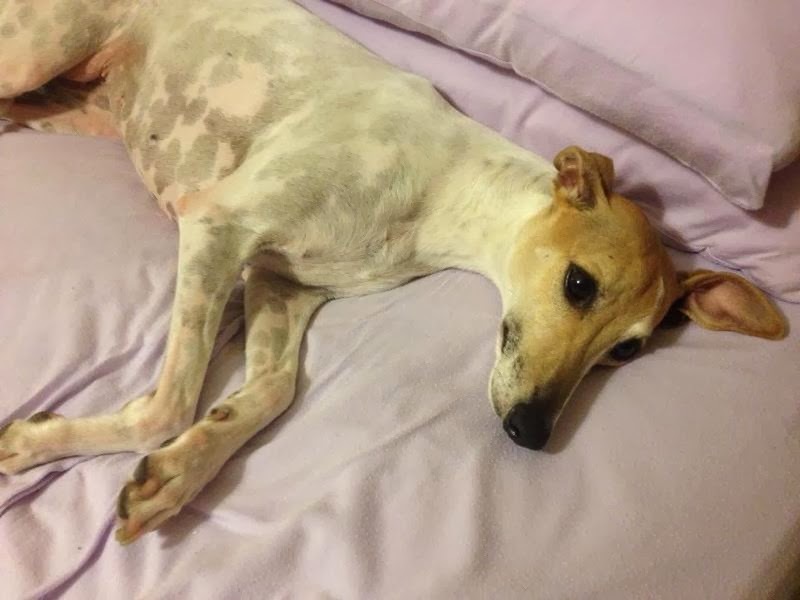 I am four years old and I was used as a breeding Whippet. When my breeder gave up her kennel license, I was placed up for adoption. A family came to visit me at the kennel. 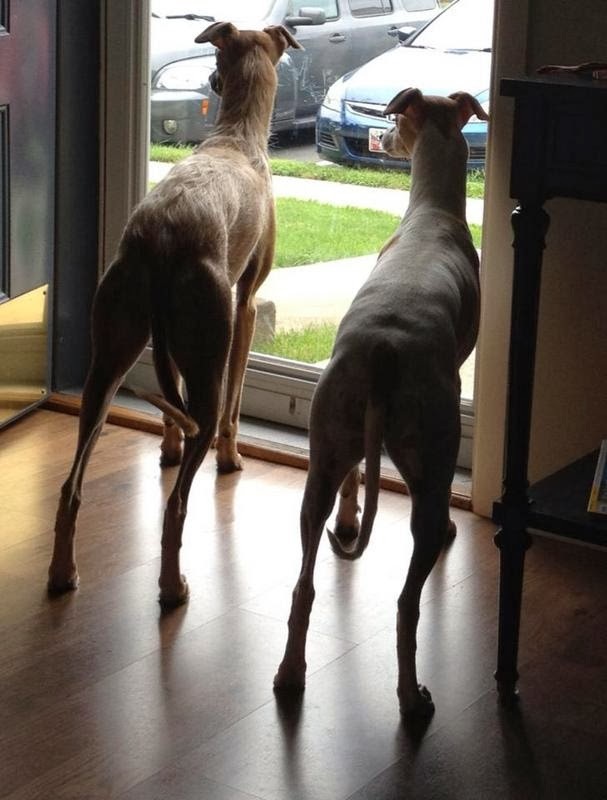 They brought their male Whippet along to meet me. His name was Rocket and he was 1 year old. When I came into the room I was very scared. I army-crawled into the room and wouldn’t make eye contact with anyone. Rocket came over, sniffed me and immediately my personality changed. I jumped up and started wagging my tail. I licked Rocket on the muzzle and he returned my kisses. The nice lady offered me a cookie and pat me on the head. She said she wanted to take me home forever. My response to Rocket was so unusual that she asked about it. I recognized Rocket. He came from the same kennel and he is my son. I was so happy to be reunited with him. The last seven months have been wonderful. I have blossomed (hence my name) into a sweet, loving little dog. 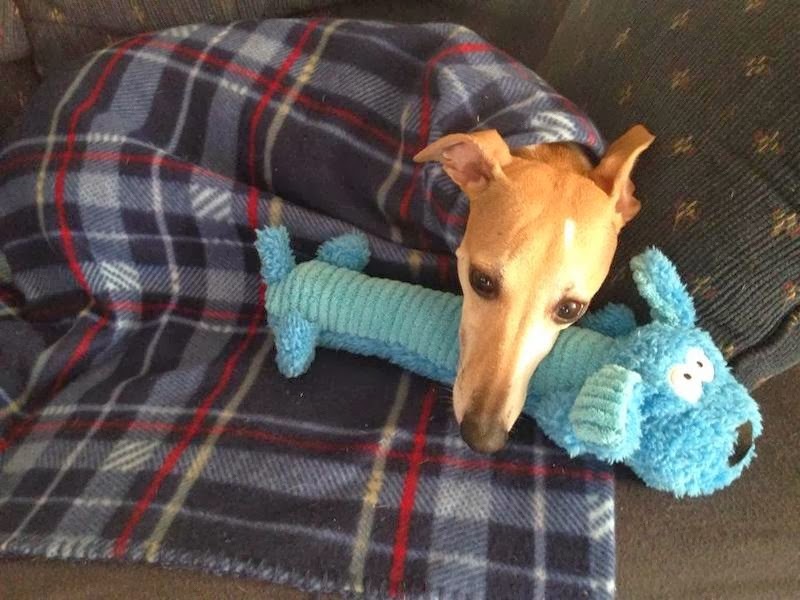 I have a loving family, a warm bed, and lots and lots of toys to play with. My mommy tells me everyday how much she loves me and I shower her with kisses to show her my appreciation for giving me a forever home. This entry was posted in Frederick MD, Kingsbrook Animal Hospital, veterinarian on March 25, 2014 by yourfriends. 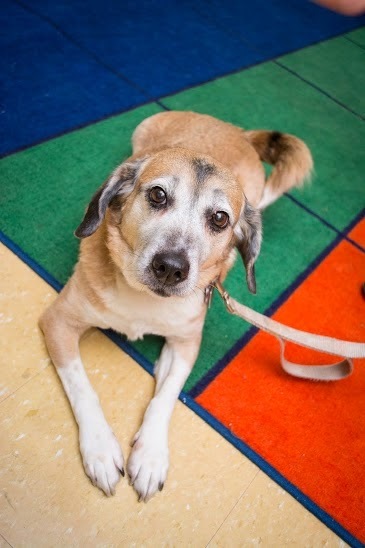 Dora is a very special friend to Kingsbrook Animal Hospital. She is a medium sized mixed breed, has been a friend to us since February 2005 and is one of the nicest little dogs anyone could ever meet. Emily adopted Dora in 2005. 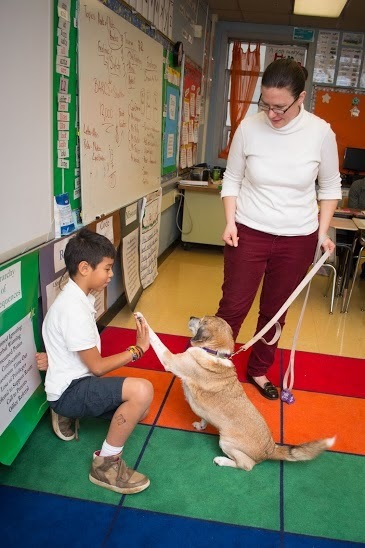 A few years after her adoption, she learned that Dora could get her Canine Good Citizenship certification through Wags for Hope. (http://www.wagsforhope.org) Dora and Emily worked hard at completing Dora’s certification, but before they knew it Dora had graduated. Dora brings great joy to anyone she meets. 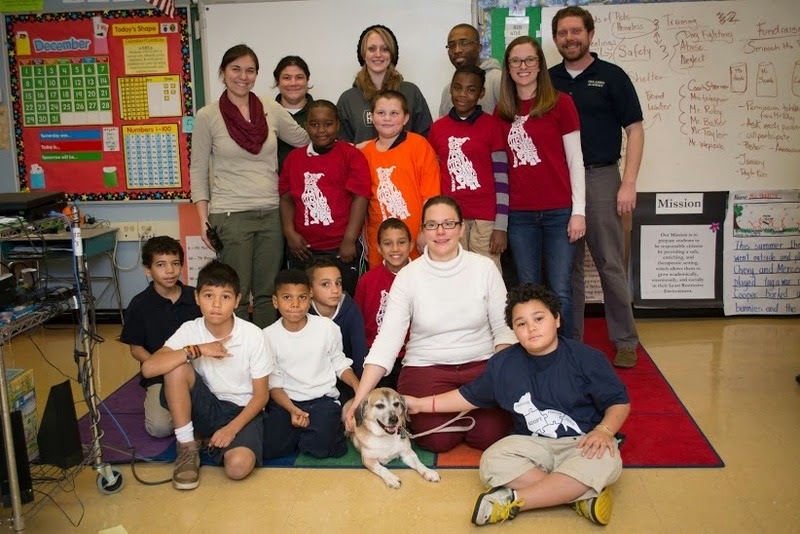 In December of 2011, Dora started visiting two nursing homes in Frederick, MD. In late February of 2011, Emily brought Dora into Kingsbrook Animal Hospital for a physical exam by her veterinarian Dr. Davis. Emily was concerned that Dora may have a urinary tract infection. Dr. Davis recommended x-rays of Dora to check for bladder stones. Well, Dora did not have any bladder stones, but something else…something they didn’t expect to find. The shape of Dora’s spleen looked abnormal. This was not the news Emily was expecting to hear. Our friend Dora had a mass that could either be benign or cancerous. Either way, if it ruptured it could cause her to internally bleed to death. Dora had an ultrasound confirming a mass was located on her spleen. More x-rays were taken to be sure it had not spread to other parts of her body. Fortunately, the x-rays were clear. Which meant we could move forward with the needed surgery to remove Dora’s spleen. On March 11, 2011, Dora had her spleen removed and was discharged later that night. Dora recovered well from her big surgery, but more bad news was to come. 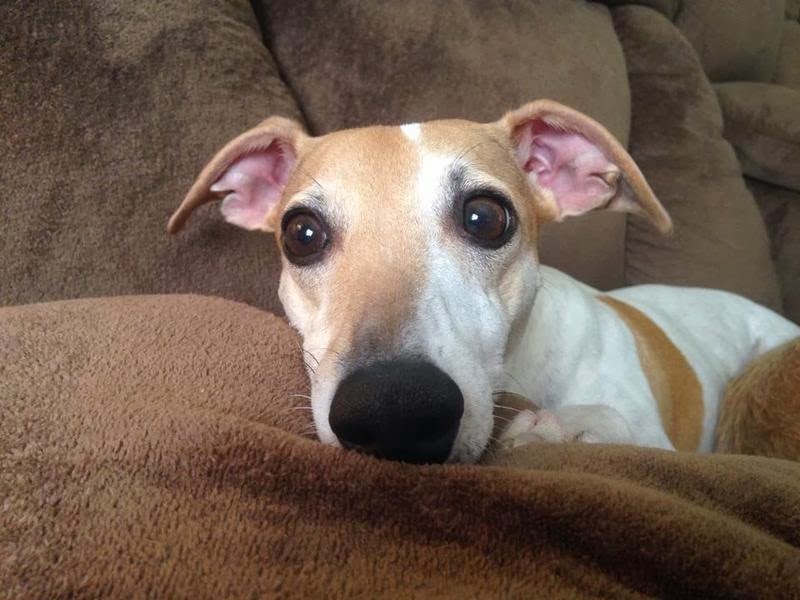 Dora’s spleen was sent out for biopsy to determine whether or not it was cancerous…and it was. This was sad news for everyone at Kingsbrook Animal Hospital and for Emily too. The average survival expectancy for a dog with hemangiosarcoma is about 6 weeks without chemo therapy and 6 months for dogs with chemo therapy and fewer than 1% of dogs will live a year. Emily had some big decisions to make about her friend. 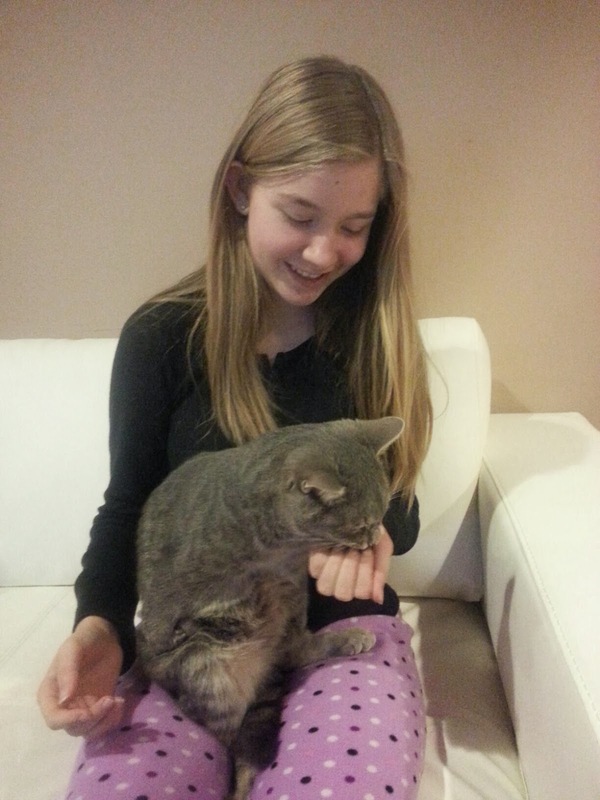 Emily decided to pursuit chemo therapy for Dora and she tolerated the treatment very well. To everyone’s surprise Dora has been going strong for almost 3 years! 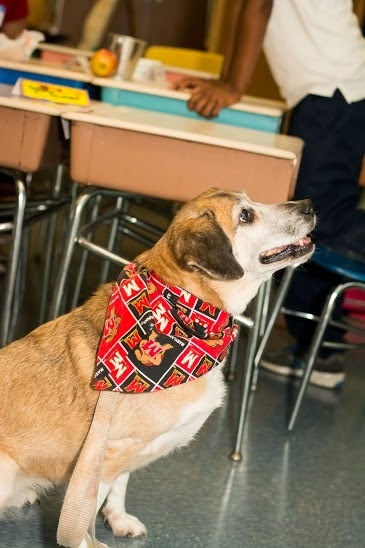 She is such an inspiration to everyone and continues to visit nursing homes, is a Reading Education Assistance Dog (http://www.therapyanimals.org/R.E.A.D.html) and is involved in a program called Project Mickey (http://www.projectmickey.org). 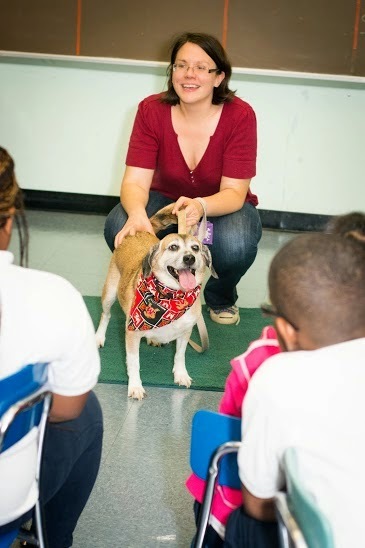 We are so fortunate to have Dora with us, she brings joy to everyone she meets…we love you Dora!!! This entry was posted in Frederick MD, Kingsbrook Animal Hospital, veterinarian on March 18, 2014 by yourfriends. This is the tale of the luckiest family in Knoxville. When I think of why I dreamed of becoming a veterinarian, it was for precisely reasons like saving Smokey Joe. Smokey Joe is a cat who joined our family just under a year ago. He was born with a birth defect causing his front legs to angle inward. His front paws are distorted and his nails grow curled and bent. He is polydactyl, has extra digits/toes, on his back paws as well. His first family was unable to care for Smokey and could not find anyone willing to adopt him. They were considering having him euthanized when one of their children reached out to my daughter hoping I could help. I still remember the day they drove up our driveway. We were NOT looking for another furry family member. I had thought that I might be able to help the little kitten and find it a good home. Smokey had never been outside and his eyes were wide and curious. I ushered everyone in and he took off with his now classic “army crawl” and “kangaroo jumps.” In fact, that is how he got his name: “Smokey” for his his gun smoke color and “Joe” because he bounds like a baby kangaroo, a joey. Smokey Joe would crawl or hop up to someone, plop down, roll over and expose his underbelly begging to be pet. (He incessantly nudges with his head to get his point across if you are too slow at interpreting his message.) He is truly one of the happiest and best natured cats around. I knew right away that his “defects” were beyond traditional repair. 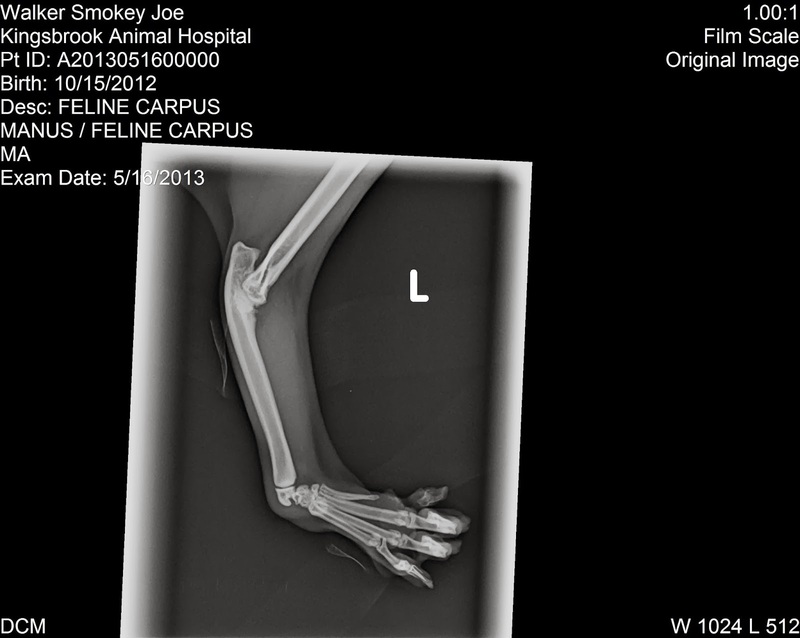 Splints could no longer help Smokey. His joints are fused and the bones are irregular. He would never be “normal.” I also knew that his little body had adapted amazingly well! His back legs have developed large muscles and his extra toes allow him to balance and bound better than any “normal” cat. I knew he could have a good and happy life. He may require a little special care, but we think he is worth it- and that makes him a perfect part of our family. Polydactyl cats often found their way onto boats because sailors believed they were good luck. They were widely recognized as top-notch mousers, and their extra toes were thought to give them better balance while sailing the high seas. This entry was posted in Frederick MD, Kingsbrook Animal Hospital, veterinarian on March 11, 2014 by yourfriends. 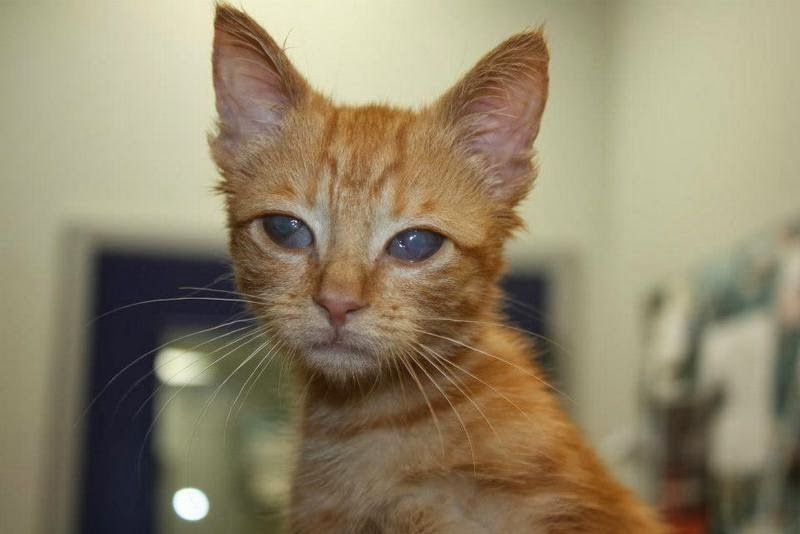 One of our most memorable come back stories is about a struggling kitten found by a good samaritan on the side of Route 15 in Frederick, Maryland. He was 5-6 weeks old when he was discovered on the side of the busy road in mid-September. 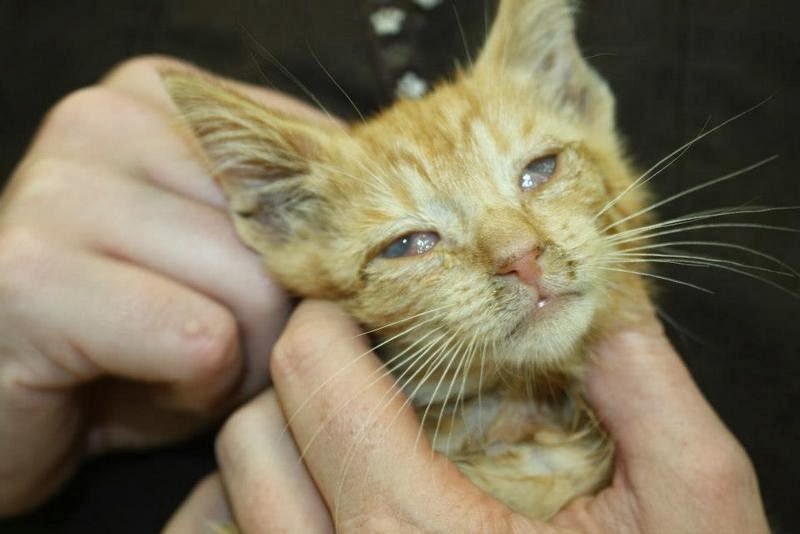 Not only was he abandoned, but also very frightened and in need of serious veterinary care. The good samaritan contacted Frederick County Animal Control. Unfortunately, they could not shelter anymore cats and based on his condition would likely euthanize him. That is where Kingsbrook Animal Hospital stepped in! After hearing of the situation and condition of the little kitten, Dr. Cook agreed to treat him for his numerous ailments and live in the hospital until we could find him a home. 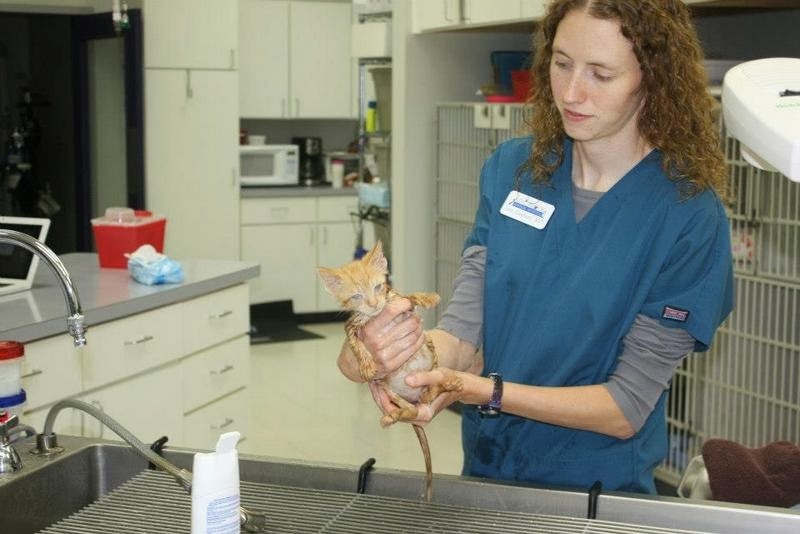 At only one pound, he was emaciated, dehydrated and suffered from ear mites and yeast infection. As if that was not enough, he had intestinal parasites, an upper respiratory infection and his eyes were severely infected and ulcerated. Medical care was started immediately with eye and ear medications, fluids, de-wormer, and antibiotics thanks to the Kylie and Cricket Memorial Fund! 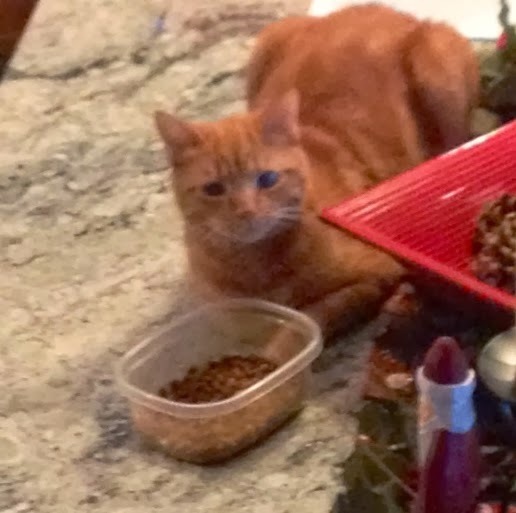 His appetite was carefully monitored to make sure he was eating and gaining weight. During treatment, his eyes were still very cloudy. The veterinarians could mildly see his iris which makes his ability to see very low, if at all. He was diagnosed blind, but could potentially see shadows. That did not slow him down at all! Once he was feeling better, his charismatic personality earned him the nickname “Dennis No Menace!” He was very affectionate and would purr and start “making biscuits” as soon as he was picked up. He loved to play and we gladly obliged every chance we had. 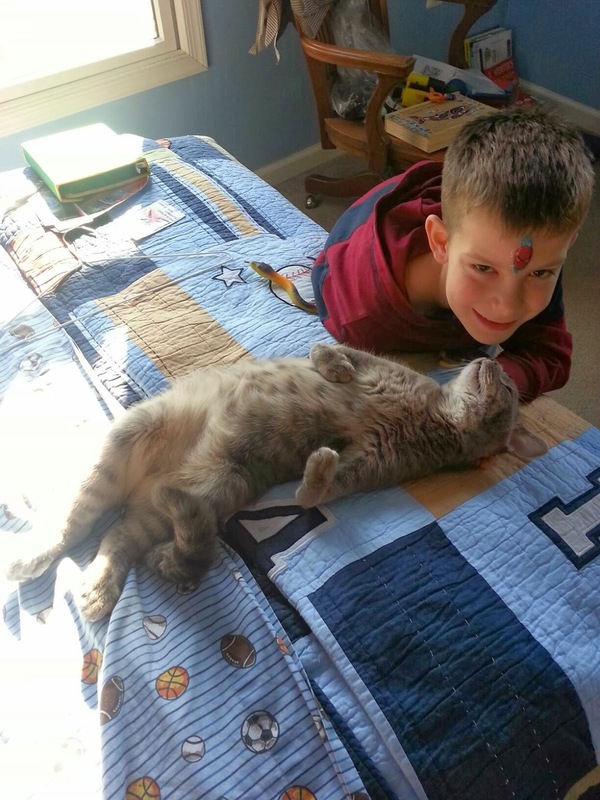 It wasn’t long before someone found room in their heart for this special needs kitty. He was adopted that November and renamed “Ray Charles”. He now lives in Portland, Maine with his family which includes a cat and 2 dogs that he loves to play with. His owners think that he can see some shadows based on the fact that he likes to whack the dog’s tails! He is a very happy cat now that his days on the streets are far behind him. Ray Charles is a Happy Cat!! 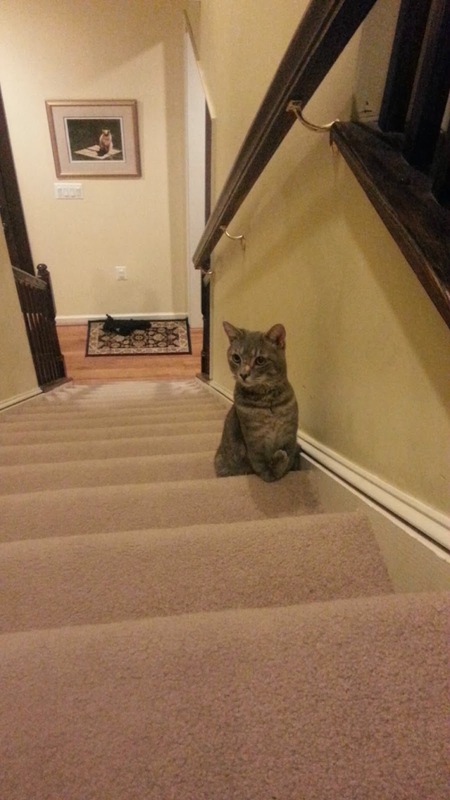 This entry was posted in Frederick MD, Kingsbrook Animal Hospital, veterinarian on March 4, 2014 by yourfriends.